We have a limited supply in stock for the holidays, so contact us today before they’re all gone! 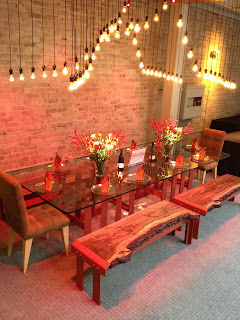 On November 14th and 15th, we were proud to be a part of a collaboration with MTP Architects and Lightswitch Architectural in creating a dining vignette for DIFFA’s Dining By Design Gala. The vignette celebrated the progress in the search for a cure, as well as the 75th Anniversary of the Golden Gate Bridge. 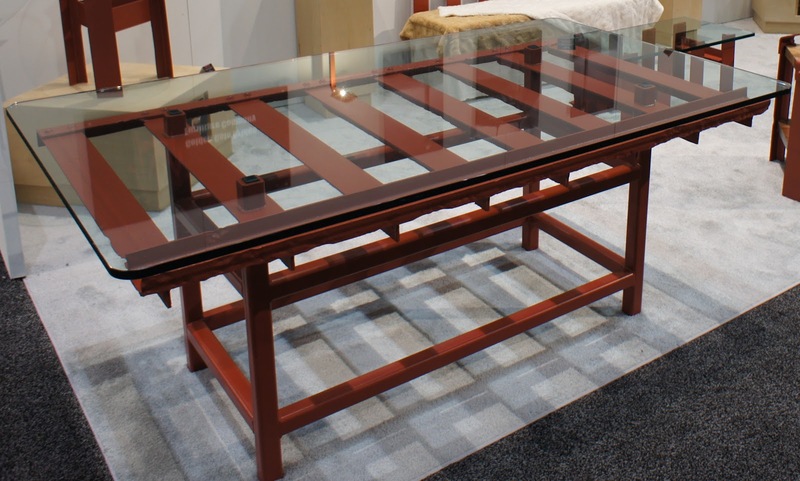 The 48" x 130" glass table top rested upon two table bases crafted from historic Golden Gate Bridge handrail. 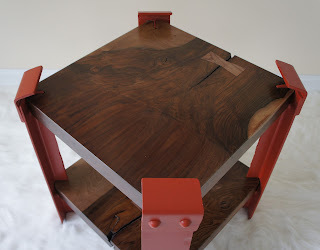 The benches were crafted from the same handrail material and locally sourced California Walnut. The lighting was comprised of simple lamp pendants representing the 31 year AIDS struggle, with the red lamp illustrating the peak of the epidemic in 1995. Come visit our Facebook photo album for a behind the scenes look at the creation of this table's design. 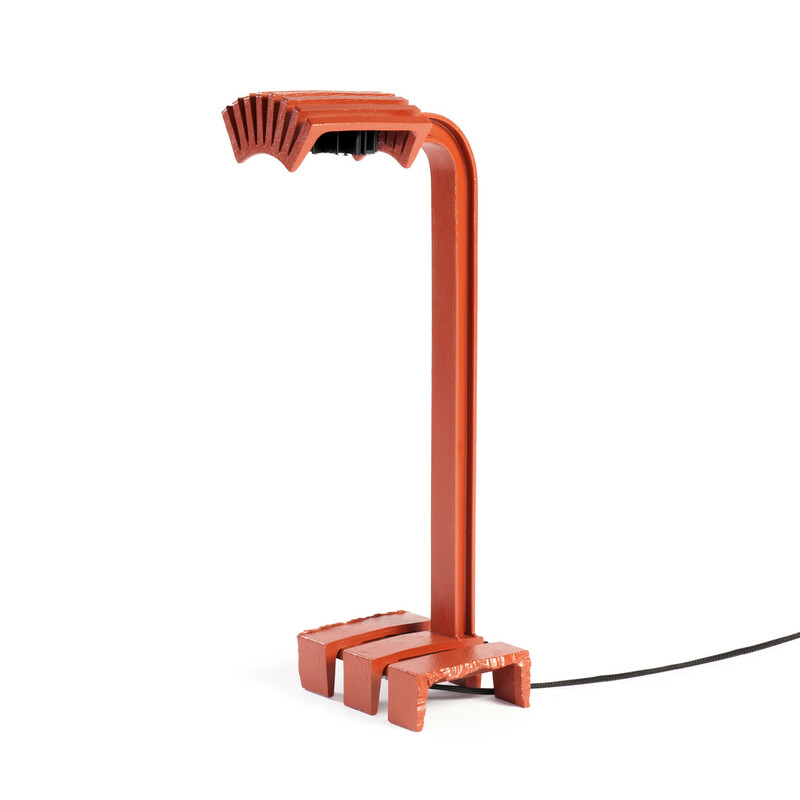 The Task Lamp utilizes some of the smaller pieces that are left over from the sections of historic handrail after crafting our larger designs. You can read more about it here in an earlier post. The Club Table design incorporates urban salvaged Claro Walnut featuring a graft line where the two species of wood grew together. You can read more about it here in an earlier post. The company that crafts unique artisan furniture from original steel removed from San Francisco’s Golden Gate Bridge will debut two large table designs at the Dwell On Design Show in Los Angeles this June. 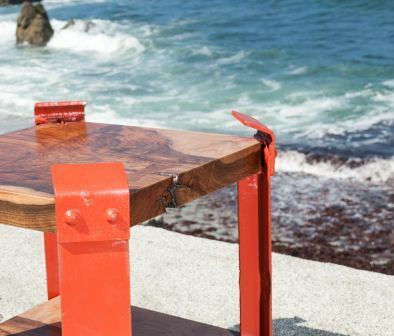 Pacifica, CA (June 1, 2012) – Golden Gate Bridge Furniture Company (GGBFC) is preparing to exhibit their product line of limited edition furniture crafted from original steel off the Golden Gate Bridge at the upcoming Dwell On Design show in Los Angeles. GGBFC, who will be exhibiting their unique hand crafted designs in Booth 408, plans to debut two new large table designs: The Executive Desk and The Conference Table. GGBFC is the brainchild of San Francisco area resident, Richard Bulan. The company creates limited edition artisan furniture from original steel that was placed on the Golden Gate Bridge during its construction in the 1930’s. Richard crafts his designs from sections of pedestrian handrail that were removed during the Bridge’s handrail replacement in 1993. He acquired the handrail in 1994 and has since created and put into limited production a headboard design, nine table designs, and two lamp designs. To learn more about the company and its designs, GGBFC invites you to visit them at the Dwell on Design exhibition in Booth 408. 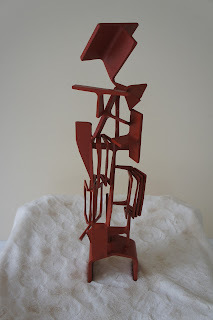 The show is open Friday June 22 from 10am to 8pm, Saturday, June 23, 10am to 6pm, and Sunday June 24, 10am to 5pm. Richard Bulan can be contacted directly by phone at 415-661-6263 or by email at richard@ggbfurniture.com. 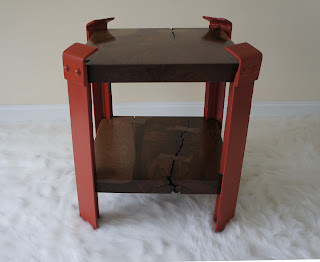 For additional information on the company, feel free to visit the GGBFC website at www.ggbfurniture.com. For more information on the Dwell on Design exhibition, visit www.dwellondesign.com/ggbridge12. 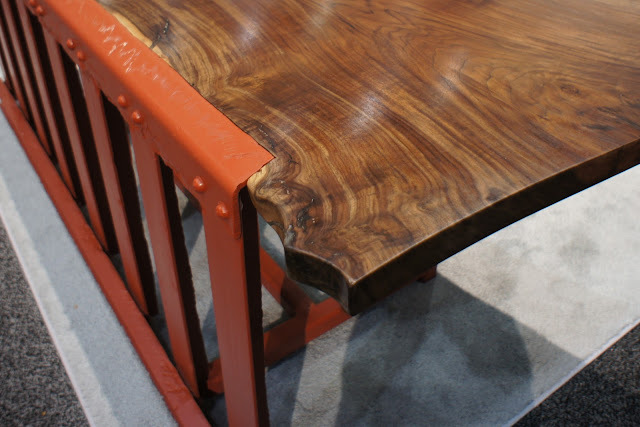 The company that crafts unique artisan furniture from original steel removed from San Francisco’s Golden Gate Bridge will be an exhibitor in the selective MADE section at the Architectural Digest Home Show in New York this upcoming March. Pacifica, CA (February 1, 2012) – Golden Gate Bridge Furniture Company (GGBFC) is preparing to exhibit their product line of Limited Edition furniture crafted from original steel off the Golden Gate Bridge at the upcoming Architectural Digest Home Show in New York. GGBFC will be exhibiting their unique hand crafted designs in Booth M182 of the distinctive MADE section of the design show, which features individual one-of-a-kind works of art and furnishings. GGBFC is the brainchild of San Francisco area resident, Richard Bulan. 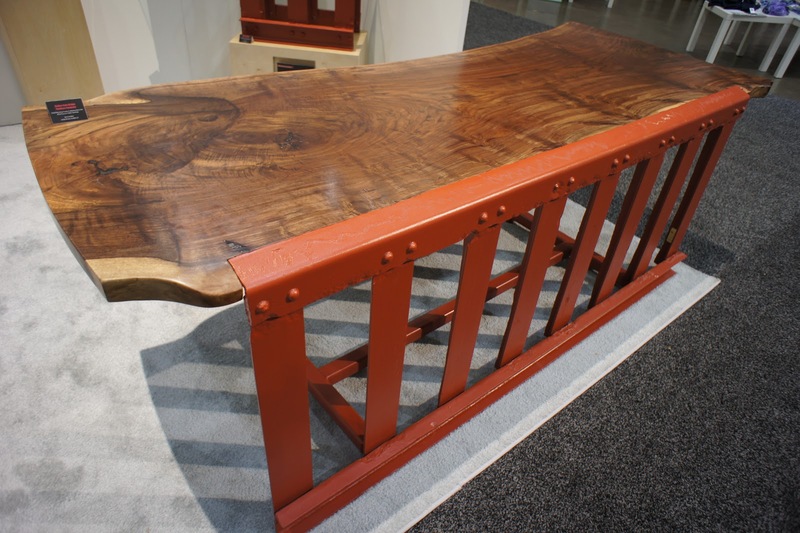 The company creates Limited Edition Artisan Furniture from original steel that was placed on the Golden Gate Bridge during its construction in the 1930’s. Richard crafts his designs from sections of pedestrian handrail that were removed during the Bridge’s handrail replacement in 1993. 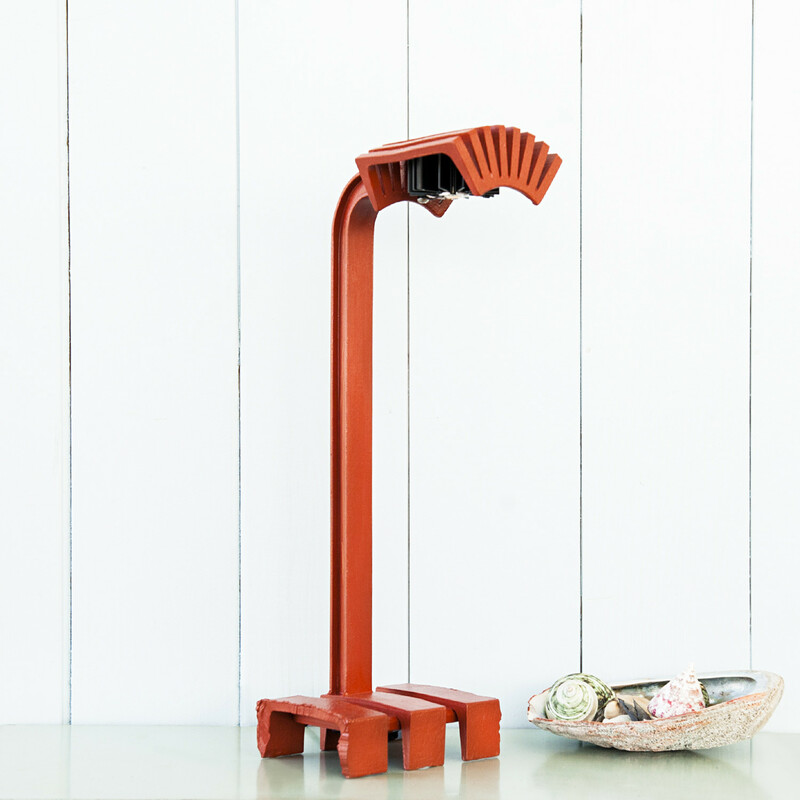 He acquired the handrail in 1994 and has since created and put into limited production a headboard design, eight table designs, and two lamp designs. To learn more about the company and its designs, GGBFC invites you to visit them at the Architectural Digest Home Design show in Booth M182. 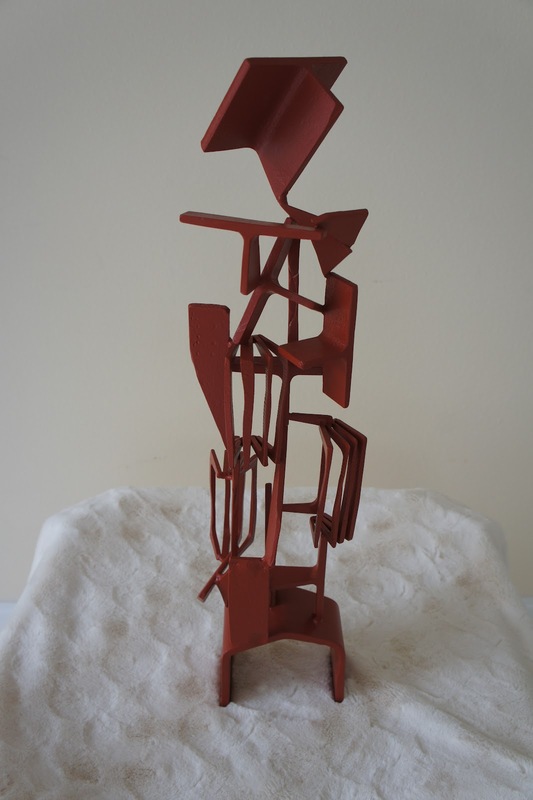 The show opens to the Trade and Preview Guests on Thursday, March 22 from 10am to 7pm, and then it is open to the public Friday, March 23 and Saturday, March 24, 10am to 7pm, and Sunday March 25, 10am to 6pm. 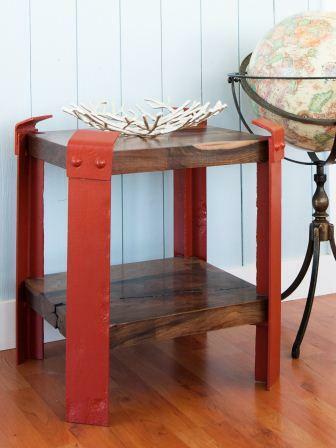 Richard Bulan can be contacted by phone at 415-661-6263 or by email at richard@ggbfurniture.com. For additional information on the company, feel free to visit the GGBFC website at www.ggbfurniture.com. For more information on the Architectural Digest Home Design Show visit www.archdigesthomeshow.com.